CryptoMoney is a clean, modern, stylish lading page for Cryptocurrency, bitcoin and ICO agency. any kind of creative agency website. 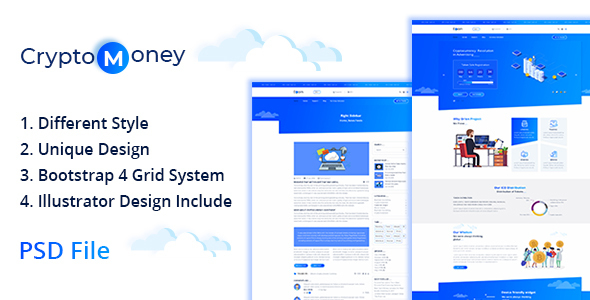 CryptoMoney is Bootstrap4 grid system based and 8 modern designs. CryptoMoney is the best landing page for such Cryptocurrency agencies. CryptoMoney has all the necessary components to make it useful, working and full functional Cryptocurrency website. Active and Hover Layers are included. Every page is fully layered and organized with proper names.